I normally look at a rolling 13 months, so we can see what's happened over the last year. But today I wanted to see a little more history, to see if it can help us spot any emerging trends, so I'm pulling in the last 25 months' data. 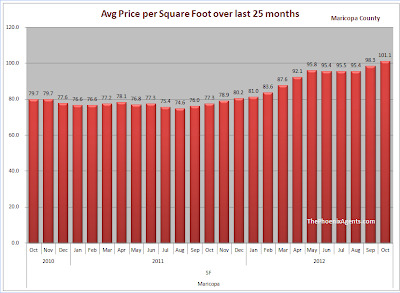 Sold Price per Square Foot - You can argue any individual property as having unique qualities and not tying exactly to the price per square foot trend. And that can be very true for a given property. But for the market as a whole, no other statistic gives us a better feel for which direction the market is going..
New Vacant Listings as a Percentage of the Total - a "normal" market will have some vacant listings; a "Great Recession" market will have lots of vacant listings. I'm expecting this chart to show a downward trend over the next year, as more traditional sellers get back into the market. 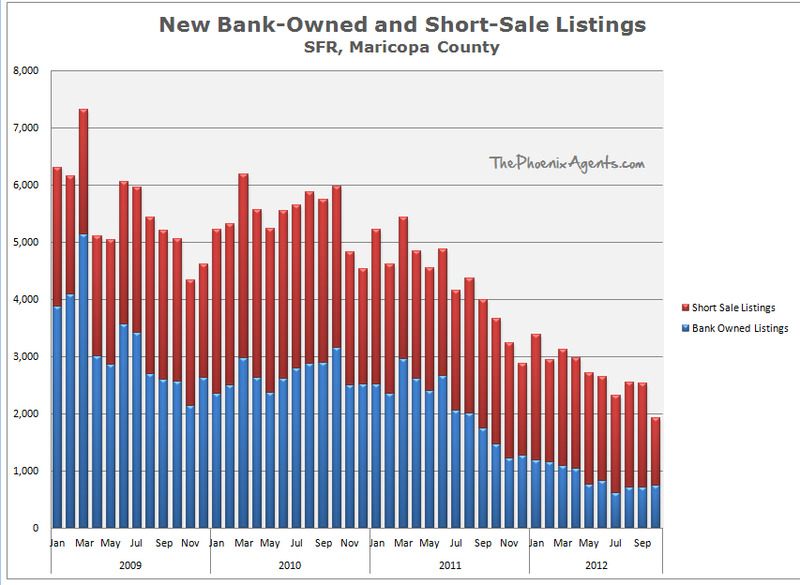 New Bank-Owned and Short-Sale Listings - If the banks are involved, people are still hurting. This causes excess inventory over what would normally be available. 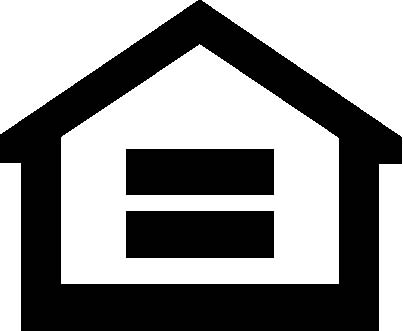 It also puts a "homeowner" on the sidelines for a few years while he/she repairs their credit. A downward trend on this graph is a very good thing. We've been moving in the right direction, slowly but surely, for a long time. 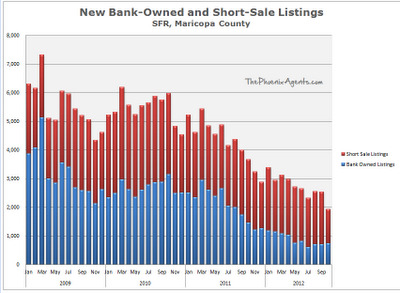 Last month was the first time in a long time with fewer than 2,000 new distressed listings. Prices are still on the rise. (a little faster than I'd like to see, but better up than down.) This helps people who were borderline underwater regain positive equity. It also helps people who have been waiting for a better time to sell, to sell. All of these factors will help lead us back to a more normal market. 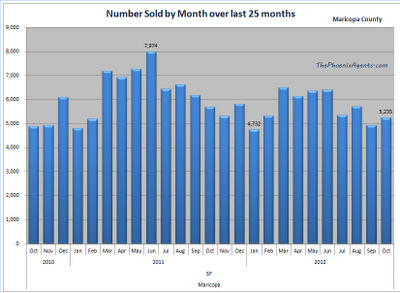 Homes are still selling at a brisk pace. Maybe not record numbers, but we have enough volume that the market isn't in danger of stagnating. 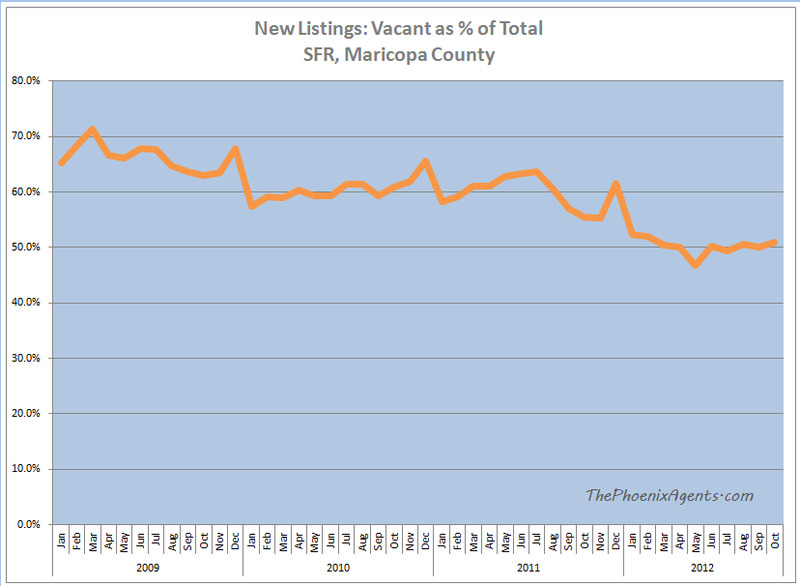 Note - all data was pulled from the Arizona Regional Multiple Listing Service (ARMLS) and is considered accurate but not guaranteed.